When Taylor Kreiling set out to help Bucks County families at Christmas, she sought some expert advice. A few years ago, Kreiling was having “a hard time finding places to volunteer at” in East Stroudsburg, where she attended college. During her semester breaks at home, she still had difficulty connecting with the right service opportunity. That’s when she decided to contact archdiocesan Catholic Social Services (CSS) at its Bucks County Family Service Center. “I asked if they could provide me with a list of families I could host a Christmas breakfast for,” said Kreiling. The CSS staff did just that, drawing on the center’s extensive knowledge of area families in need. Kreiling assembled a team of volunteers and organized a holiday breakfast for some 60 children. Five years later, what began as a small holiday gathering has now grown into an annual tradition, one that filled the cafeteria at Conwell-Egan Catholic High School on Dec. 16. More than 47 families, including some 130 children, enjoyed brunch prepared by a team of volunteers. 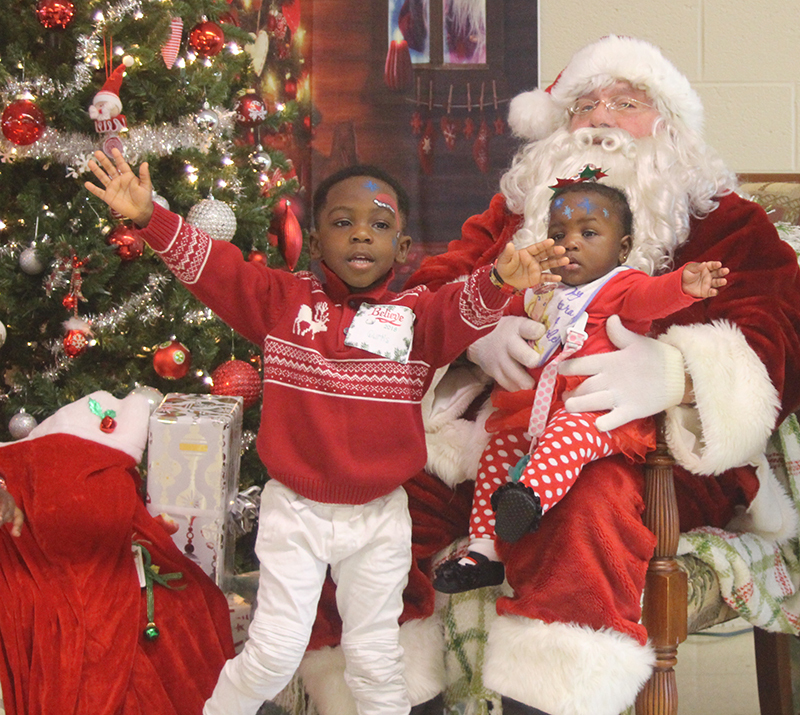 Toys, clothing and other gifts, all carefully wrapped, were distributed as Santa and Mrs. Claus posed for pictures with each family. Face painting, games and music rounded out the morning’s festivities. Carmen Giovanni enjoyed the holiday cheer with her husband Sergio and their infant daughter, Belén. CSS also assisted an additional 30 families with their Christmas celebrations, thanks to a donation drive supported by area parishes. 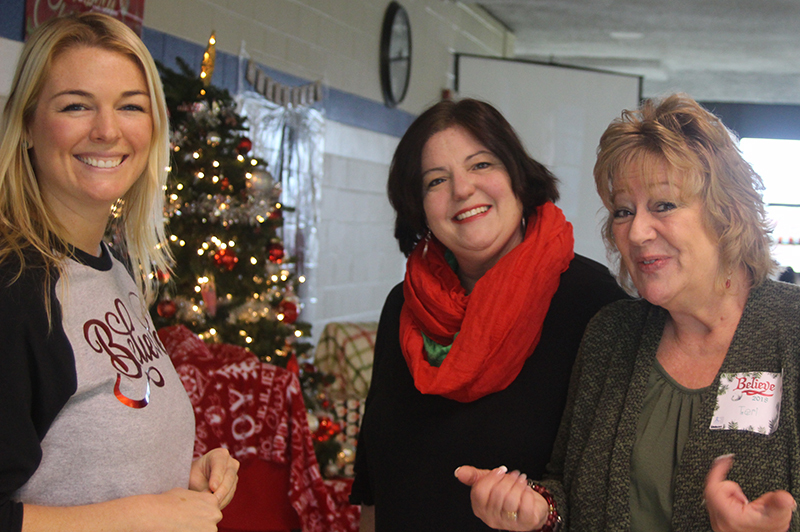 The agency’s experience and connections make coordinating such outreaches possible, said Teri Mitchell, the administrator of CSS’s Bucks County Family Service Center. “The trusted name of CSS gives a lot of credibility to what we’re doing and the families that we’re working with,” Mitchell said. Kreiling, who marshalled donations from several area businesses for the brunch, said that CSS had been a “wonderful, warm” partner in her efforts. “They’re able to provide lists of families, genders, ages, clothing and shoes sizes, plus lists of favorite stores and hobbies,” she said. That in-depth knowledge comes from spending time with area families to “really identify their unmet needs,” said Mitchell. In addition, CSS focuses on the root causes of a given family’s struggles, such as food insecurity, parenting challenges and financial difficulties. As part of this more holistic approach to social services, even the annual Christmas brunch becomes much more than a “one-off” event. “We’re able to engage the families after the holidays, in January and throughout the rest of the year, because they trust us,” Mitchell said. The center’s clients are “engaged in a process” that ultimately empowers them to make more informed and productive choices in managing their lives, she added. Rather than offering a handout, “we provide a hand that’s extended, that says walk with us, and let us walk with you,” Mitchell said. The families themselves help to navigate this journey, Mitchell added — particularly when they participate in CSS’s pregnancy and parenting groups.